This interview was conducted at the international conference Contemporary Muslim Consumer Cultures – an Emerging Field of Studies held on 24-27 October and organized by the Institute for Islamic Studies at the Free University of Berlin. The proceedings will be published in 2009 in a book edited by Johanna Pink entitled Muslim Societies and Globalisation: State, Economy and Individuals in the Age of Mass Consumption. 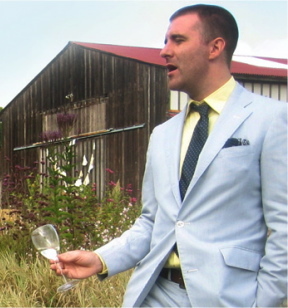 Michael Hastings Black graduated from Bowdoin College in 2000 with a BA in English literature. He worked as an urban planner for the New York City (NYC) Department of Parks from 2000 to 2002 and then entered the film industry, co-founding Desedo, a NYC-based commercial production company that specializes in new media and minority markets in 2005. Religioscope – Michael Hastings Black, could you explain us how you developed your interest in American Muslims as a marketing target group? 1) Last fall, my business partner Raafi Rivero wrote an article entitled ‘Black nerds‘ that went viral and was picked up everywhere from USA Today to MIT to the CBC. His thesis was that in the new media space of blogs/youtube/social networks, we are seeing a more complex portrait of black American life. This is because the content is being created by many different black people – as opposed to the tropes we normally see trotted out via Hollywood and Madison Avenue. At our office, that starting a lot of thinking about how new media represents a transformative space for many groups historically reduced to stereotypes within the mass media. And as company, we began exploring how to work within these spaces. 2) Our friend Tanuj Chopra directed the feature film Punching at the Sun, which is a story about South Asian teenagers living in New York City. Within this family drama were both the identity politics of the American racial/cultural remix and the post-9/11 trend of identity conflation, i.e. a non-religious Indian teenager could be said to ‘look Islamic’ and then be labeled as threat to America. So I started reading a lot more about conflation within media, reading and speaking with Muslim bloggers and content creators. 3) The ad agency JWT calculated the American Muslim consumer space at $170 billion. Seeing that it’s overlooked by many, in business terms, it’s a blue ocean. Religioscope – New media seem to be more dialogic in terms of depicting minorities in the US. At the same time, the global image of the Muslim identity group seems to be quite negative. How would you balance the respective effects of the 9/11 aftermath and the democratization effect of new media? Michael Hastings Black – What’s most important about new media is the fact that they are a space dialogue and self-depiction. Regardless of what the mass media do with monologue, online is a space in which Muslims can author their own stories, ones that can be consumed by other Muslims and non-Muslims. Here we see an ever-increasing diversity of voices who speak as Muslims, from a strict imam to a spunky lesbian; just as with every other religion, there is a wealth of diversity within. It is this panoply of voices that help to counter negative and simple-minded thinking about Islam. Religioscope – You argue that 9/11’s consequences are hindering any substantial integration of Muslim symbols in the American public sphere as they expose any marketing campaign mobilizing on Muslim symbols to significant risks. And this despite a huge Muslim purchasing power of $170 billion. But what about the pre-9/11 period? Why was it at that time already difficult to engage the American Muslim population? Michael Hastings Black – Well, America has historically had an awkward relationship with Islam. Prior to 9/11, the mass media construct of Islam was a negative portrayal – see Said’s Orientalism, Shaheen’s Reel Bad Arab, etc. – and there is also the history of Pan Am 106, Iran hostages in 1980, World Trade Center ’93 – all crimes associated with Islam. Since mass media within America does not have many well-known Islamic people, be they entertainers, politicians, news personalities, etc., there are few voices out there to temper the trend of assuming that all Muslims think the same thing – hence racial profiling and Islamaphobia. I would guess that until 9/11 created American Muslims as ‘targets’ within our country, marketers may not have thought to target them as consumers. Religioscope – Responses to media stigmatization exist and you refer to them; series, TV comedy shows, etc. try to show a normalized Muslim identity localized in the American national narrative. What is their importance in the American media landscape: a marginal response, an effective response, or what? Are there any means to evaluate this impact, and its capacity to restore a better image of the Muslim identity? Michael Hastings Black – In the recent presidential campaign, the Republicans used the idea of Obama as a Muslim to signify him being ‘threatening/un-American’. One of the most popular TV series, 24, consistently features ‘terrorist Muslims’. As you said, the positive portrayals of Islam on-screen are few and far between. I think we may start seeing more, but I would not rely on Hollywood to assuage this situation. Which is why the authorship space of new media is all the more important, and I think that in a few years we’ll be seeing content on TV/ads that draws its roots from there. Religioscope – While there is a certain trend of Islamic revival, you describe a powerful tendency towards normalization of the Islamic identity, i.e. a wish to integrate it into the American national narrative and inside the American pop culture. Would you consider that those two trends (revival and normalization) are rivals, opposites, or interact somewhere to form a new American Muslim identity or narrative? Michael Hastings Black – Great question. To answer this, we should look first at America, then Islam and then the point of intersection, which is uniquely American. Given that the US is a country of immigrants, the idea of what is ‘American’ is ever evolving. There are many for whom the idea of America is represented by Christians of Western European descent. This exclusive concept of America is addressed in my paper. For those people, the idea of Barack Obama as president was an anathema – not only was he black, but his name sounded ‘un-American’. Yet, thankfully, the majority of Americans recognized that not only was Obama the best candidate, but knew that he was quintessentially American – a mixture of races, religions, names and hometowns. America is a hybrid nation, a remix, and is at its best when it embraces this truth. Hence practising Islam within America is a wholly American act. In the post-9/11 space, Muslims within America were quickly put in the public sphere and labeled by the government and the media as ‘un-American’. In response to this, there was often a two-pronged desire from American Muslims – to assert that they are indeed American and to be proud of practising Islam. Given the hybrid nature of America, this does not create an inherent rivalry. The US is founded on the premise of religious and expressive freedoms – hence wearing a hijab while singing hip-hop lyrics as you shop at the mall – it’s the practice of everyday American life. And in the participatory sense, one can consume American pop culture (which is an act of being American), without having to produce it if there are haram elements within it. 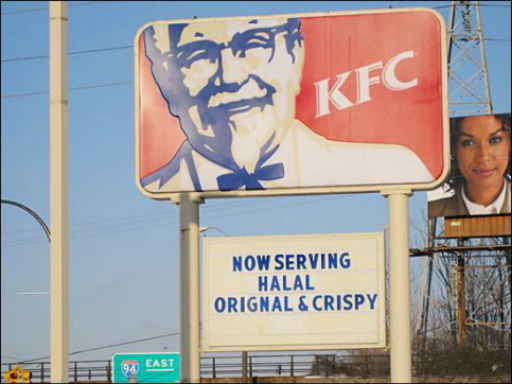 Religioscope – From a marketing professional point of view, the dilemma of including Islamic symbols in advertising and pop culture seems to be as such: either you use controversial symbols (the keffieh, the hijab) in order to reach a minority market, but you might create a tension with the majority market, or you lose a $170 billion. Is there any way out of this deadlock? Michael Hastings Black – Since brands have not yet engaged this space, there is no sense of loss. Many may not see it as having true potential. With new media as a space where you can target and engage consumer groups in a micro, rather than macro way, I believe this is where brands may begin, rather than print or broadcast TV. It might slip under the radar of those conservative Americans who would take umbrage. As discussed in the paper, we’re also seeing it in-store within the microcosm of Dearborn, MI with Wal Mart, Ikea, KFC, etc. Religioscope – Would you consider that these difficulties for a religious group to integrate the American national narrative is specific to American Muslims, or was it the destiny of other ethnic or religious minorities or cultural sub-groups in the past? Michael Hastings Black – I think that all minority groups, be they religious, ethnic, national etc., encounter difficulty integrating into America. A hundred years ago, Italians, Irish, Jews were considered ‘un-American’, and over time were absorbed into the fabric of ‘America’. This big-tent approach can be seen in the ‘I Am an American’ TV commercial that’s embedded in my paper. I know many black Americans who, in the few days since Obama has been elected, have a profound new sense of being/belonging/becoming American. The groups that I think are currently experiencing the greatest resistance are Latin American ‘illegal’ immigrants and Muslims who wear symbols of their faith (i.e. a hijabi may stand out, while a woman who does not cover would less likely be ‘identified’ as Muslim.) There was a good article in the New York Times about young Muslims supporting Obama and the public/private difficulties therein. I believe that the difficulties faced be those groups will subside over time. That said, people in any country will always have xenophobic impulses toward those who appear ‘new’ or ‘different’ to the historical narrative of ‘who’ the nation is. America may be better built to absorb changes and remixing representational politics and poetics, because it is a country of immigrants.